See all nine of the dandy winter riders here. Wintertime doesn't have to be vacation season for your bicycle. 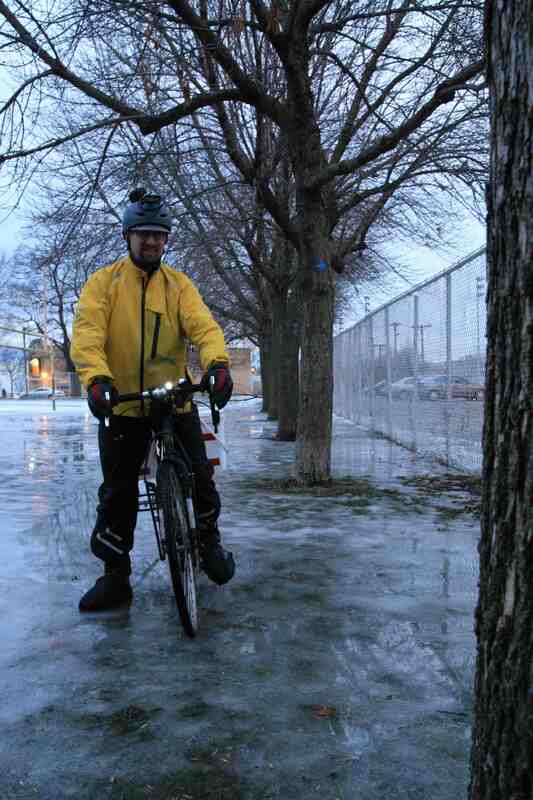 With the right equipment, cycling on icy, snow-covered wintery roads can actually be fun. The key ingredient is the right tires. Just as cars need season-specific tires, there are winter tires for bikes. 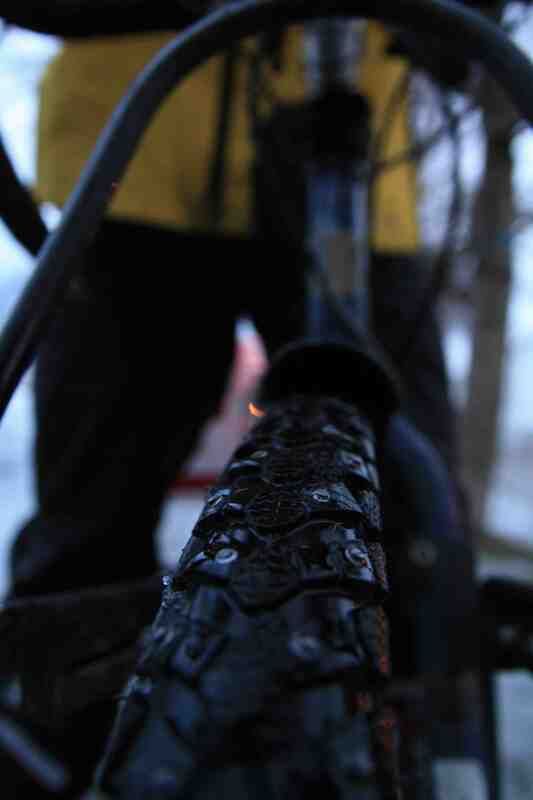 Studded winter tires give a bike an edge that allows for traction in almost any winter conditions. So why does anyone need studded tires in an urban area such as Toronto? Good question. Many urban areas enjoy adequate snow removal, that does not really describe "The Tee-Dot" especially when it comes to bicycle infrastructure. Quite often bike lanes are either unploughed, or the receptacle for all the snow pushed from the street. With proper winter tires that have studs, these obstacles can be overcome. 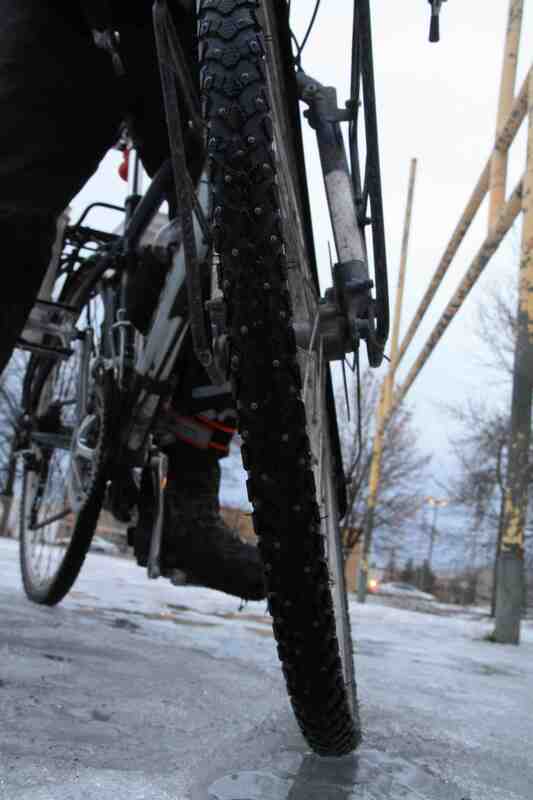 The specialized rubber compound remains supple even in -20 C weather. The winter tread pattern is designed to shed snow from its grooves, so powder snow accumulations do not become quick sand - or worse, greasy sh*t.
Studs generally become useful the more hard-packed the snow becomes or when ice invisibly rears its ugly head. With studded tires, I find I sometimes even have better traction climbing hills than in the summer time with regular tires. For me, the challenge is trying to ride the multi-use trails that the City refuses to maintain in the winter. Quite often the trail conditions are pockmarked from the frozen footprints left behind by hikers and dog walkers. With studded tires I can traverse this moonscape, but it gets tiring because my bike does not have shock absorbers. As I write this, the temperature is -18 C and about three centimeters of fresh snow has redrawn the road as one large skating rink. But me, worry? Not really. Joey Schwartz has been active in Toronto politics for almost twenty-years, in capacities ranging from serving on resident association boards, to running successful councillor campaigns. 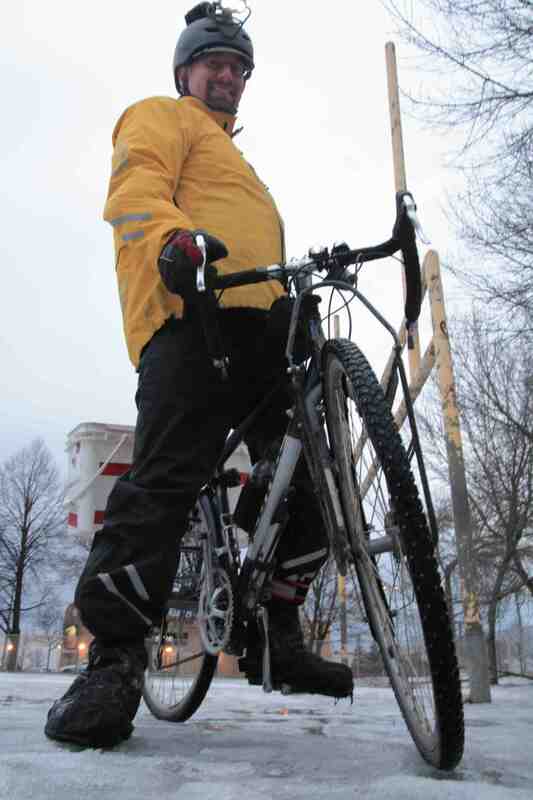 He’s been cycling around Toronto for over 20-years, as both an utilitarian and recreational cyclist. I’ve used studs in winter for several years. They do give improved traction, but are not an absolute panacea. When the tires get old, some studs fall out. Studs also tend to wear their way into the tire casing and cause punctures. When studs were still legal on cars in Ontario, my father had a set on his ’65 Volvo. He thought they were great. But the Province thought they damaged the road surface.